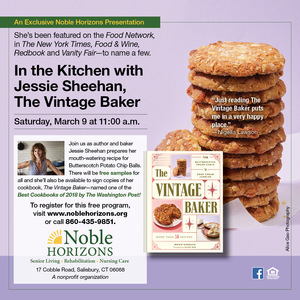 On March 9 at 11 a.m., enjoy a taste of the good old days with acclaimed author and baker Jessie Sheehan who will prepare and share samples of two delicious desserts from her newest book, Vintage Baker. Featured in The New York Times; Vanity Fair; Food and Wine and The Oprah Magazine to name a few, Vintage Baker was named a Best Cookbook of 2018 by The Washington Post. Ms. Sheehan will prepare chocolate walnut marshmallow fudge and butterscotch potato chip balls during her demonstration and her guests will not only imbibe in a taste of each, but may purchase her books which she will sign.